The fashionable asymmetrical pendant is made in the technique of embroidery beads Textile Necklaces. Brown Orange Black cabochon glass handmade with yellow and red drops. Embroidery on artificial suede fabric is very pleasant. 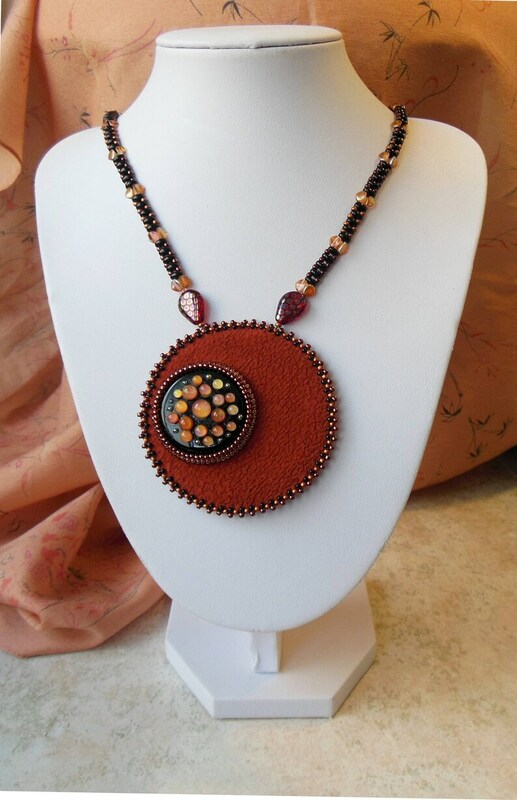 Round pendant is surrounded by Czech and Japanese beads. Handmade jewelry in the style of boho. It will be a beautiful accent an coordinating with many outfits. I hope you find what you are looking for in my shop. (Colors may vary depending on the screen resolution). A delicate, beautiful, and unique hand-made necklace. I've received many compliments every time I've worn it. Love the sequence baby hair bands. I wish there were more to order. I just received them and they appear to be made of great quality and skill. I LOVE LOVE LOVE absolutely LOVE this set. Made to perfection and with Style. Set in Black and white. Simply elegant and beautiful. Superior style, sale and shipping. I am completely satisfied with this sale. Looking forward to shopping with this shop in the future. Reginao "rocks". I accept payments on Paypal, all major Credit cards are acceptable on Paypal. . Please make your payment within 48 hours. If payment is not received after 3 days, The transaction will be automatically canceled and the items would be relisted. Easy and friendly, I accepts refunds no questions asked as long as they are returned within 14 days with no damage on the item. Please, remember shipping cost is on your responsibility. Please notice we will not be able to accept customize items - Customized items sell is final. The orders will be shipped off within 1 working days. We are using registered air mail service. Shipping time from Israel depends on the destination and takes about 14 - 20 days. If you want to receive your order faster, please contact us before purchase for Express (EMS) shipment rates. It takes 3 - 5 business days and costs around 18$ - 30$ depending on the weight and destination. Your item will be shipped to the address provided by ETSY. If your address has changed, please let us know as soon as possible. Please check back often because new items appear every week. You may see something else you like. If you are interested in wholesale – please contact us. We offer special discounts for any order which includes more than 5 items. If you miss any detail or measurement of our garments, please don't hesitate to contact us. If their is any issue with your order Please contact me Promise to resolve it to your satisfaction !